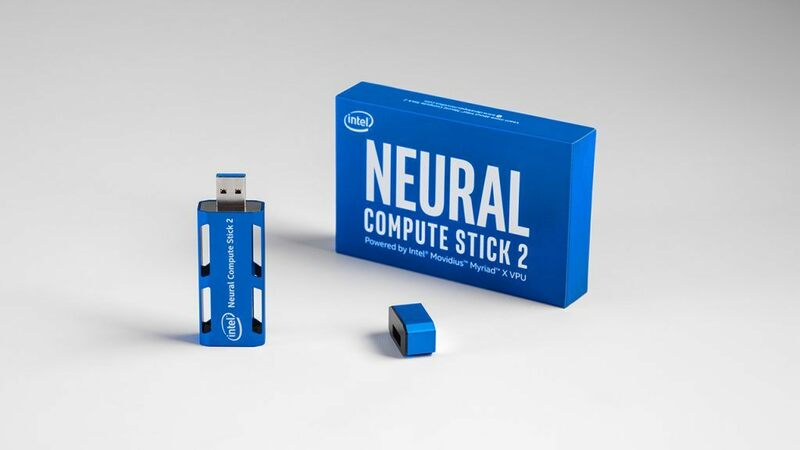 Introducing the New Intel® Neural Compute Stick 2 – Intel’s next generation AI inference development kit. From identifying the rarest animal species to counting millions of product SKUs on grocery store shelves, computer vision applications span a wide variety of innovative use cases. These network edge devices require form factors that meet the needs of space and power-constraints while speeding solution development with integrated stacks of hardware and software. 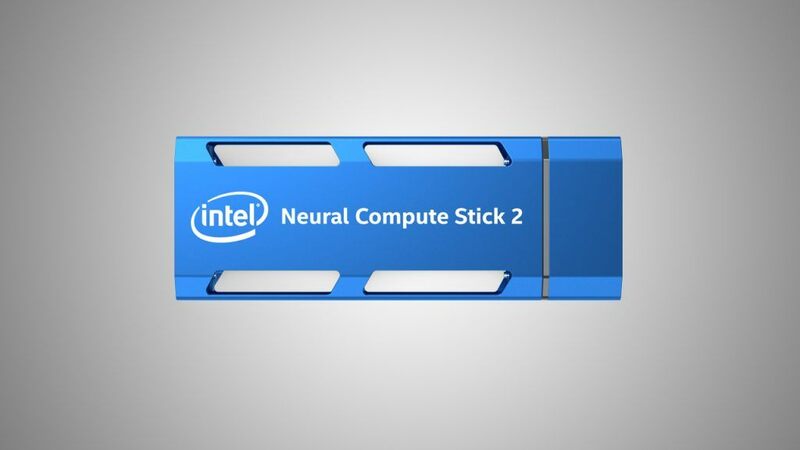 The Intel® Neural Compute Stick 2 (Intel® NCS 2), which was introduced today at Intel AI Devcon in Beijing, is purpose built for computer vision and AI inference applications, making it faster and easier to develop products for the network edge. 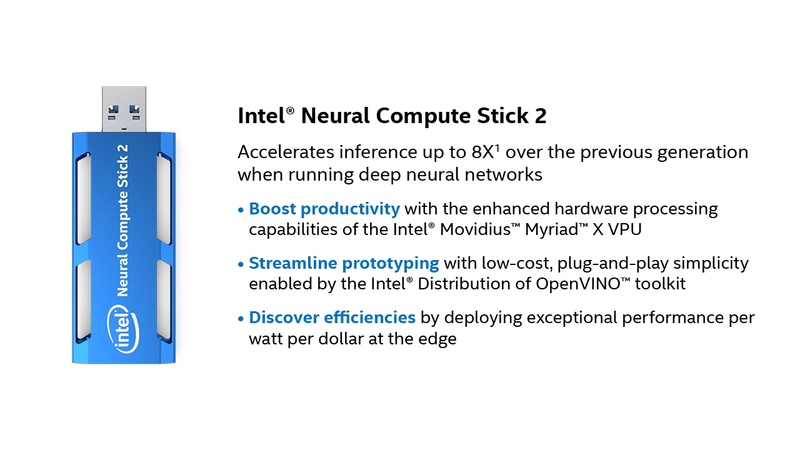 Based on the Intel® Movidius™ Myriad™ X vision processing unit (VPU), Intel NCS 2 boosts performance up to 8x1 over the previous generation for running deep neural networks. 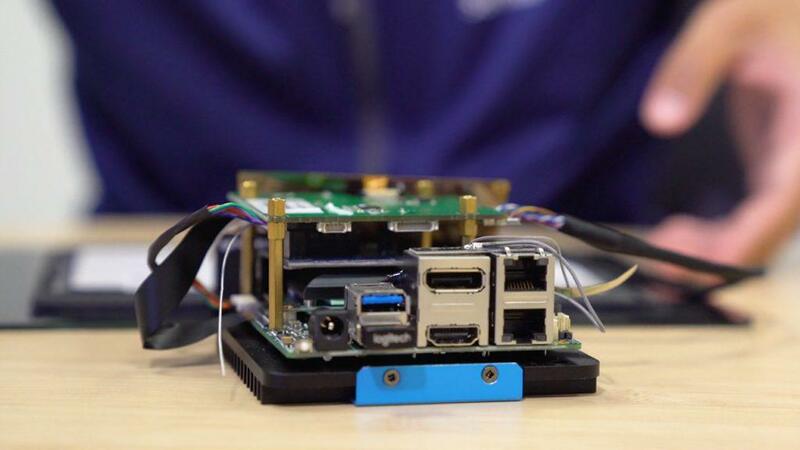 Combining it with the Intel® Distribution of OpenVINO™ toolkit gives you an optimized development kit for computer vision and AI. When you’re developing AI solutions, you want to be able to start projects at low cost and see where they go. For the ones that look promising, it’s important that the solution can scale and transition directly to whatever production hardware you need. With its unique approach to solving the performance and power challenges inherent in embedded architecture and sparse data structure, the Intel NCS 2 is an affordable, convenient approach for prototyping that can later be ported to scale production. 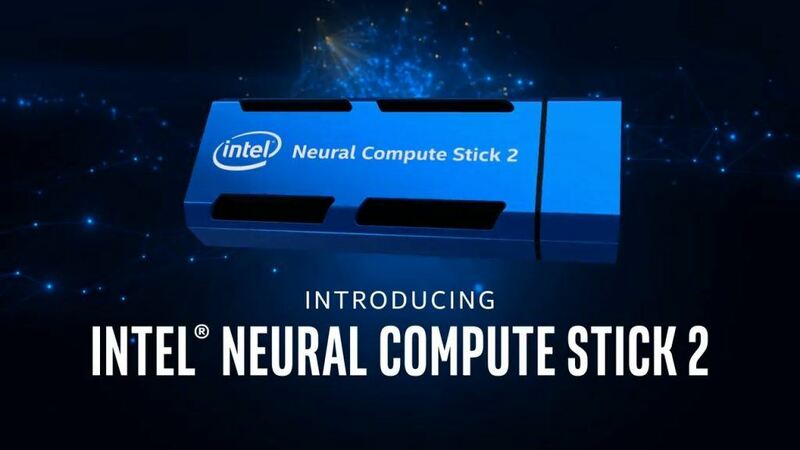 Using a USB 3.0 form factor for ubiquitous connectivity, the Intel NCS 2 helps you get AI inference and computer vision applications up and running quickly. For example, after being developed, tuned, and tested on a laptop for, DNNs can be deployed to any prototype endpoint device with a USB port, to support on-device inference independent of cloud or other connectivity. Then when solutions reach perfection, the Intel® AI: In Production ecosystem partners allows you to rapidly deploy your prototype to a variety of embedded form factors such as mini-PCIe or M.2 cards based on the Intel Movidius Myriad X VPU. All this, without having to change or modify your code thanks to the Intel Distribution of OpenVINO toolkit and its “write once, deploy everywhere” approach. The heart of Intel NCS 2 is the Intel Movidius Myriad X VPU, the new generation of low-power AI inference processor designed specifically for running deep neural networks (DNNs) at high performance. It features the Neural Compute Engine, a dedicated built-in hardware-based accelerator for DNN inferences. The array of 16 programmable SHAVE (Streaming Hybrid Architecture Vector Engine) cores represents an increase of 33 percent over the last generation, supported by an ultra-high throughput intelligent memory fabric. The Intel® Distribution of OpenVINO™ toolkit makes it faster and easier to build software that emulates human vision. Libraries of pre-trained models, optimized computer vision algorithms, and sample code save you from having to build solution underpinnings from scratch. That lets you focus on secret sauce instead of scaffolding. 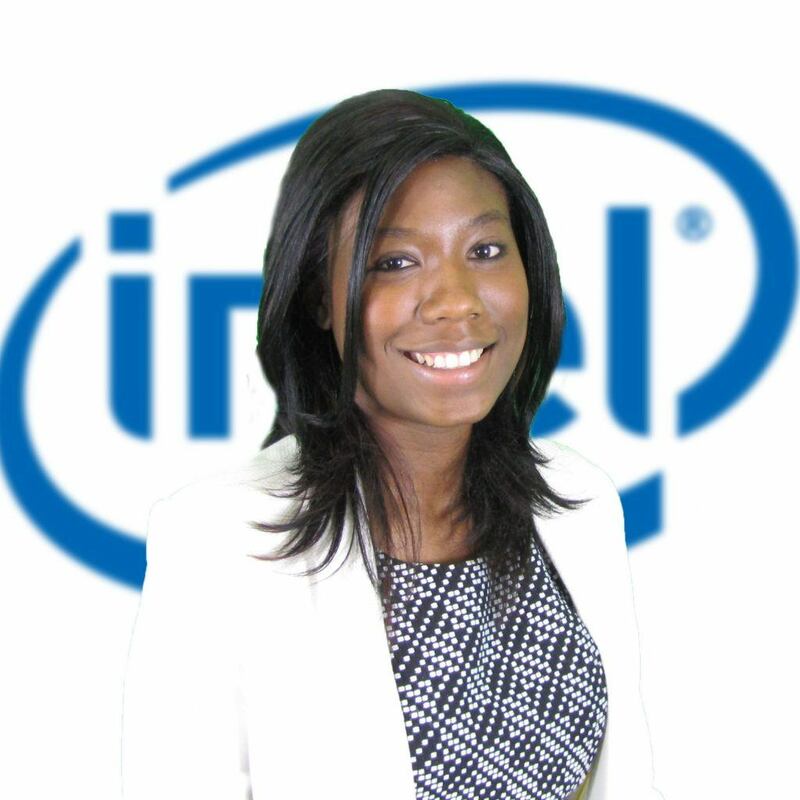 The toolkit is also the key for enabling “write once, deploy everywhere” development with the Intel NCS 2. A common API makes workloads at home on all kinds of computer vision platforms and accelerators from Intel, including CPUs, Integrated Graphics, FPGAs and the VPU inside Intel NSC 2. The Intel NCS 2 is here to usher in a new generation of smarter devices. So bring your smart cameras, robots, and drones. Bring your innovative ideas. And bring them all to life. 1 Testing by Intel as of October 12th, 2018. Deep Learning Workload Configuration. 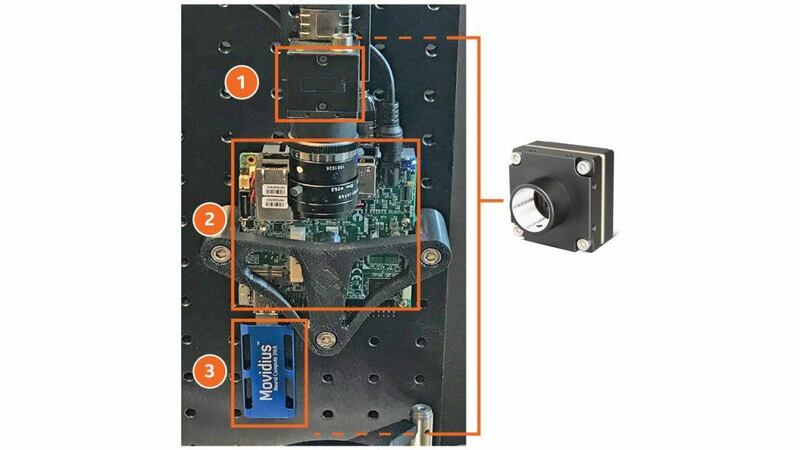 Comparing Intel® Movidius™ Neural Compute Stick based on Intel® Movidius™ Myriad™ 2 VPU vs. Intel® Neural Compute Stick 2 based on the Intel® Movidius™ Myriad™ X VPU with Asynchronous Plug-in enabled for (2xNCE engines). As measured by images per second across GoogleNetV1*. Base System Configuration: Intel® Core™ I7-8700K 95W TDP (6C12T at 3.7GHz base freq and 4.7GHz max turbo freq), Graphics: Intel® UHD Graphics 630 Total Memory 65830088 kB Storage: INTEL SSDSC2BB24 (240GB), Ubuntu* 16.04.5 Linux*-4.15.0-36-generic-x86_64-with-Ubuntu*-16.04-xenial, deeplearning_deploymenttoolkit_2018.0.14348.0, API version 1.2, Build 14348, myriadPlugin, FP16, Batch Size = 1. Performance results are based on testing as of October 12th, 2018 and may not reflect all publicly available security updates. See configuration disclosure for details. No product can be absolutely secure.